Identifying scoring talent is one of the main areas of investigation in analytics circles, with the information provided potentially helping to inform decisions that can cost many, many millions. Players who can consistently put the ball in the net cost a premium; can we separate these players from the their peers? I’m using data from the 2008/09 to 2012/13 seasons across the top divisions in England, Spain, Germany and Italy from ESPN. An example of the data provided is available here for Liverpool in 2012/13. This gives me total shots (including blocked shots) and goals for over 8000 individual player seasons. I’ve also taken out penalties from the shot and goal totals using data from TransferMarkt. This should give us a good baseline for what looks good, bad and extraordinary in terms of scoring talent. Clearly this ignores the now substantial work being done in relation to shot location and different types of shot but the upside here is that the sample size (number of shots) is larger. Below is a graph of shot conversion (defined as goals divided by total shots) against total shots. All of the metrics I’ll use will have penalties removed from the sample. The average conversion rate across the whole sample is 9.2%. Using this average, we can calculate the bounds of what average looks like in terms of shot conversion; we would expect some level of random variation around the average and for this variation to be larger for players who’ve taken fewer shots. Shot conversion versus total shots for individual players in the top leagues in England, Italy, Spain and Germany from 2008/09-2012/13. Points are shown in grey with certain players highlighted, with the colours corresponding to the season. The solid black line is the average conversion rate of 9.2%, with the dotted lines above and below this line corresponding to two standard errors above the average. The dashed line corresponds to five standard errors. Click on the image for a larger view. On the plot I’ve also added some lines to illustrate this. The solid black line is the average shot conversion rate, while the two dotted lines either side of it represent upper and lower confidence limits calculated as being two standard errors from the mean. These are known as funnel plots and as far as I’m aware, they were introduced to football analysis by James Grayson in his work on penalties. Paul Riley has also used them when looking at shot conversion from different areas of the pitch. There is a third dotted line but I’ll talk about that later. So what does this tell us? Well we would expect approximately 95% of the points to fall within this envelope around the average conversion rate; the actual number of points is 97%. From a statistical point of view, we can’t identify whether these players are anything other than average at shot conversion. Some players fall below the lower bound, which suggests that they are below average at converting their shots into goals. On the other hand, those players falling above the upper bound, are potentially above average. I’m not sure if this is surprising or not, but it is actually quite hard to identify players who fall below the lower bound and qualify as “bad”. A player needs to take about 40 shots without scoring to fall beneath the lower bound, so I suspect “bad” shooters don’t get the opportunity to approach statistical significance. Some do though. Only 62 player seasons fall below the lower bound, with Alessandro Diamanti, Antonio Candreva, Gökhan Inler and (drum-roll) Stewart Downing having the dubious record of appearing twice. Downing actually holds the record in my data for the most shots (80) without scoring in 2008/09, with his 2011/12 season coming in second with 71 shots without scoring. Over a single season of shots, it is somewhat easier to identify “good” players in the sample, with 219 players lying above the two standard error curve. Some of these players are highlighted in the graph above and rather than list all of them, I’ll focus on players that have managed to consistently finish their shooting opportunities at an above average rate. Only two players appear in each of the five seasons of this sample; Gonzalo Higuaín and Lionel Messi. Higuaín has scored an impressive 94 goals with a shot conversion rate of 25.4% over that sample. I’ll leave Messi’s numbers until a little later. Four players appear on four separate occasions; Álvaro Negredo, Stefan Kießling, Alberto Gilardino and Giampaolo Pazzini. Negredo is interesting here as while his 15.1% conversion rate over multiple seasons isn’t as exceptional as some other players, he has done this over a sustained period while taking a decent volume of shots each season (note his current conversion rate at Manchester City is 16.1%). Eighteen players have appeared on this list three times; notable names include van Persie, Di Natale, Cavani, Agüero, Gómez, Soldado, Benzema, Raúl, Fletcher, Hernández and Agbonlahor (wasn’t expecting that last one). I would say that most of the players mentioned here are more penalty box strikers, which suggests they take more of their shots from closer to the goal, where conversion rates are higher. It would be interesting to cross-check these with analysts who are tracking player shot locations. To some extent, looking at players that lie two standard errors above or below the average shot conversion rate is somewhat arbitrary. The number of standard errors you use to judge a particular property typically depends on your application and how “sure” you want to be that the signal you are observing is “real” rather than due to “chance”. For instance, when scientists at CERN were attempting to establish the existence of the Higgs boson, they used a very stringent requirement that the observed signal is five standard errors above the typical baseline of their instruments; they want to be really sure that they’ve established the existence of a new particle. The tolerance here is that there be much less than a one in a million chance that any observed signal be the result of a statistical fluctuation. As far as shot conversion is concerned, over the two seasons prior to this, Lional Messi is the Higgs boson of football. While other players have had shot conversion rates above this five-standard error level, Messi has done this while taking huge shot volumes. This sets him apart from his peers. Over the five seasons prior to this, Messi took 764 shots, from which an average player would be expected to score between 54 and 86 goals based on a player falling within two standard errors of the average; Messi has scored 162! Turns out Messi is good at the football…who knew? This entry was posted in Bundesliga, English Premier League, La Liga, Serie A, Shooting and tagged Bundesliga, EPL, La Liga, Messi, Serie A, Shooting, Shot conversion by Will Gurpinar-Morgan. Bookmark the permalink. Really interesting read – the statistics show just how good Messi actually is. Thanks, great article. Thank you. Messi is truly exceptional! Interesting. Fletcher as in Steven Fletcher? Really?! Yes! Certainly at Wolves he was very much a penalty box finisher which likely inflates his conversion percentage. 1. Messi’s conversion rate isn’t streets ahead of all the competition, in some seasons it’s worse. Therefore showing the reason he breaks records is as much to do with the volume of shots he takes rather than just precision/ability, considering he isn’t known for shooting often from long range. 2. Messi isn’t renowned for shooting at any half chance from distance like c.ronaldo or suarez for example. I highly suspect that a high % of his shot positions are from inside the 18 yard box. The fact that he has so many shots from highly promising positions reflects very well on the service he receives, and maybe you can conclude the Barcelona system does indeed boost messis own stats quite dramatically. Ronaldo shoots quite a lot from distance so I don’t think the evidence of quality service is quite as strong in that case though, and the same with suarez. 3. My final observation, the three players with most shots happen to benefit from having their teams attack totally built around them. Real Madrid and Barcelona have obviously done that with messi and ronaldo (notice how messi had much less shots in 08 09 when the team wasn’t totally pandered to him), it’s also the case with suarez and van persie who were big fish in small ponds. Especially van persie, in the 11/12 season having sold their best players every arsenal attack went through and was finished off by van persie. I find all this very interesting, much glory and hyperbole is ascribed to the individual who breaks statistical goal scoring records, I think this indicates how flimsy that can be. The tactics and quality of the team is evidently a major factor in such things. 1. I would say the impressive thing about Messi is that he is able to sustain a conversion rate way above average while taking a large volume of shots. Nobody else in this data has shown a capacity to do that. Such a combination means he’ll score a lot of goals. 2. This is something I want to look into and Barcelona/Messi are the obvious example for this. I suspect part of Messi’s conversion rate is shot location driven. It certainly seemed that many of the players who were above average were more penalty box strikers. 3. This is another thing I would like to look at. The players you’ve mentioned are obvious examples but it would be interesting to look at how different teams distribute their shots across players. Given the popularity of one striker systems, you might expect to see a large proportion of a team’s shots going through one player as they might set up to provide for their main striker. Taking advantage of this is another thing though and to me this reflects well on Messi and Ronaldo; not only are they considered good enough for two of the best sides around to build their attacking strategy around them but they are also good enough to take advantage of it. Not all players will be up to this. As someone who is fascinated by how teams setup, I very much agree with your last statement! Thanks again for commenting. Thank you, I enjoyed reading this blog and the statistical data you provided. Regarding messi, presuming his shot location stat is similar to a “poacher” , the question is does he score vastly more because he is simply a much better goalscorer, or would other poachers with similar conversion rates reach similar numbers if they had as many shots as him? In his defence, he is probably the most effective bar none, at creating opportunities for himself near the goal with his dribbling control, and an important cog himself in making the Barcelona system work, so even shot location wouldn’t show the whole story . But still, the situation with his goal scoring form seems distorted from the reality other goal scorers face. For example I watched Barcelona’s away match to Valencia this season in which he scored a hat trick, he missed 5 very clear cut chances, and some other less clear chances, yet still got a hat trick. It’s surely a rarity that a player can afford to miss several big chances in a game but still bag a few goals, but it happens quite often at Barcelona, for a very long time now. It doesn’t really matter if he’s in lethal form, he still usually scores eventually regardless given how many opportunities are made. I guess it’s logical that if you put a very great player in a great team some aspects of their game will be utilized more than would be possible in a lesser team. Yes, Messi scores a lot of goals from inside the penalty area? But is he a poacher who just takes advantage of good service by his team mates and just have to put the ball in, mostly against one on one with keeper or in the empty net? Obviously not. He brings the ball into the penalty area through the legs of many defenders or with one-two passes or via running into the area to beat the defender and collect the pass. There have been only a very few players ever who were capable of doing it. So what the rest of the guys do? They will either try to shoot from way outside or pass it someone else. And not many can be successful in the former as well. And there have been a quite a few guys who have been successful in it like Ronaldo, Zlatan, Bale etc. However, they were taking lots of shots from outside the area because they have more chances of scoring if they shoot from that place (outside the penalty area) rather than they try to bring the ball forward (trying to dribble past a couple of defenders or doing one-two or whatever Messi does to bring the ball near to the goal). So all that matters is how many shots you have taken, how many shots your team mates have taken and how many goals you have scored. The number of shots taken by team mates is important because if you shoot from outside, you might be denying a chance for your team mate. If you shoot lots of times from outside the 30 yards area that obviously affects your team (Townsend for Tottenham). Ronaldo doesn’t effect negatively because even if he wastes lots of shots by shooting from outside, his team creates enough chance almost every game to create chances for his team mates. Just read this article and the comments. I have to reply to the second point of this comment, because it relies on unjustified and ultimately false assumptions. Messi in fact does take long shots, and also converts them with a top of the world rate. Since 2009, he has taken 475 shots from outside the box in La Liga, CL and World Cup (2014), and converted 45 of them. That’s a 9,5% accuracy. Outside box conversion rates average around 3%. Even for free kicks, around 5%. Messi has kept consistently almost 10% conversion rate from distance. In comparison, Ronaldo, who admittedly takes more of long shots, probably the most of all, has in the same competitions in same period registered 860 shots from outside the box, converting 43 of them for a more mundane rate of 5% (that would go down if we counted also 2012 European Championships and the qualifiers, in both of which he took double digit of shots from outside of the box without converting a single one). Now, it is true that Messi takes more shots inside the box than Ronaldo, so this does turn it to his favor a bit, but he converts both long and short distance shots better. In the given period, Ronaldo has taken 650 non-penalty shots inside the box, excluding headers, converting them with a decent rate (22%), whereas Messi has taken 723 but converted them with rate 26.5%. So, while it is true that Messi shoots less from outside the box than Ronaldo, he actually takes a lot of them, more than for example Suarez (who averages about 1.5/game against Messi’s 2.5/game, but converts with an almost as stunning 8.5% rate), and converts them with a rate that is amongst the top of the world every season, and in the long run possibly the best in the world (I’m not sure if there is anybody else keeping this high average over such a high number of shots). 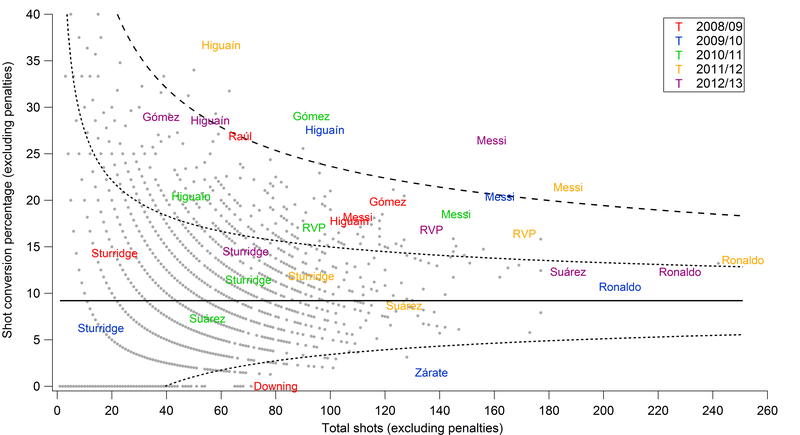 The point of the article stands also for the shots from outside the box: Messi is the only one who consistently combines the quantity with quality, taking a lot of shots and still converting them with a top rate, year after year. This didn’t seem right to me and I had to converse with my wife, who is a statistician to be able to explain why. That’s not the case. Because you have multiple seasons’ data for players, you can derive a standard deviation for each player over multiple seasons. If you do this, you can see whether their mean shot conversion ratio +- two standard deviations overlaps with the overall mean. If it doesn’t, then you can say with confidence that they are better/worse than average. To expand on what I said above – imagine a striker with a conversion rate of exactly 10% over each of the five seasons. His standard deviation is 0, so you could say (at any confidence level) that he is significantly better than average. Another point that may be obvious – past performance is not a reliable guide to future performance! If I wasn’t clear, I meant it is difficult over a single season to judge a player in this way. You can look at multiple seasons but for this analysis, I wanted to look at single seasons and identify players who were repeatedly above average. There are many statistical tests that one could use. I have previously looked at repeatability from season to season and in general, this metric fluctuates a lot from season to season. I’m planning to do more on this in the future. A system which depends on stretching the opponent and make spaces will help any striker and give him more space and time to shoot, let alone him being Lionel Messi. I’m surely not saying that Leo shoots like a kid. I’m saying that he doesn’t have the power to execute long range shots that Ronaldo , for example, has. It’s unlikely that Messi will score anything like Ronaldo’s goals against Porto and Osasuna. Players like the Portuguese are “allowed” to shoot from anywhere because “it worked” for them in several occasions. On contrary, Messi’s lack of power force him to take his shoots in the nearer areas, where scoring is generally more probable. Almost all his goals are either from inside the penalty area or just outside it. Am I reading it wrong or did Higuan have around 37% conversion rate in 2011/12 ? WOW !! As you can see, I liked it.